The name for this recipe pretty much says it all. There is some spice, a little sweet from the pineapple, veggies with the cauliflower, and protein from the pork. Boom! 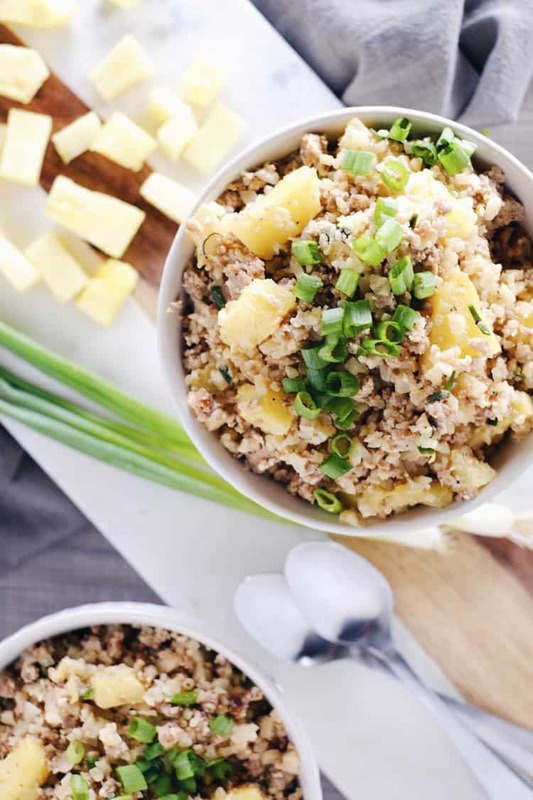 Oh yeah, and serve this spicy pineapple cauliflower pork fried rice in a bowl, and you’ve got our favorite kind of meal! Let’s detour for a brief moment to talk about cauliflower rice. 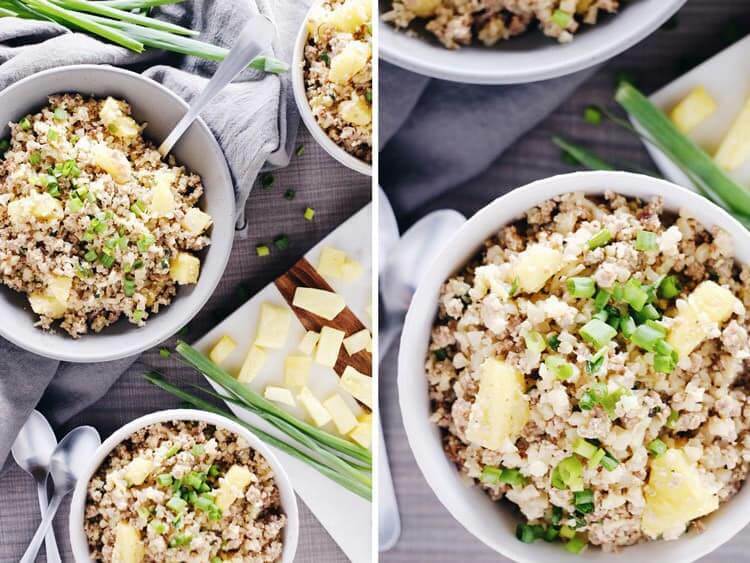 We still eat regular white rice from time to time, but really do enjoy cauliflower rice. When you pan fry it, it gets a little crispy and gets a texture pretty similar to regular rice. 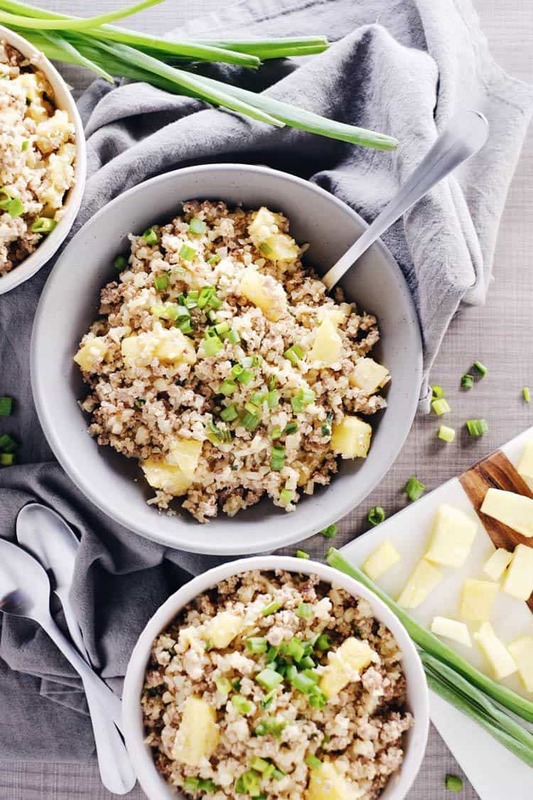 Plus, when you use it for a dish like this spicy pineapple cauliflower pork fried rice, you really can’t even tell the difference with the mixture of flavors and textures, so why not add some veggies to your meal? You might as well get a little extra nutrition in your bowl. You can rice cauliflower a couple of ways. First, and the easiest, is to use a food processor with the grating blade. This is the most no-fuss, no mess way to rice cauliflower. Next, you could use the regular S blade for your food processor and pulse until your cauliflower is grainy. The risk here is over processing, and you’ll end up with a mash instead of rice. Lastly, you can hand grate cauliflower to achieve the rice like texture, but this is the messiest option. For all of you who don’t even want to fuss at all with ricing cauliflower, you can buy pre-riced cauliflower at Trader Joe’s in either the frozen or the fresh produce sections. We use our food processor or the pre-riced stuff from Trader Joe’s to save time and effort. Do what works for you! 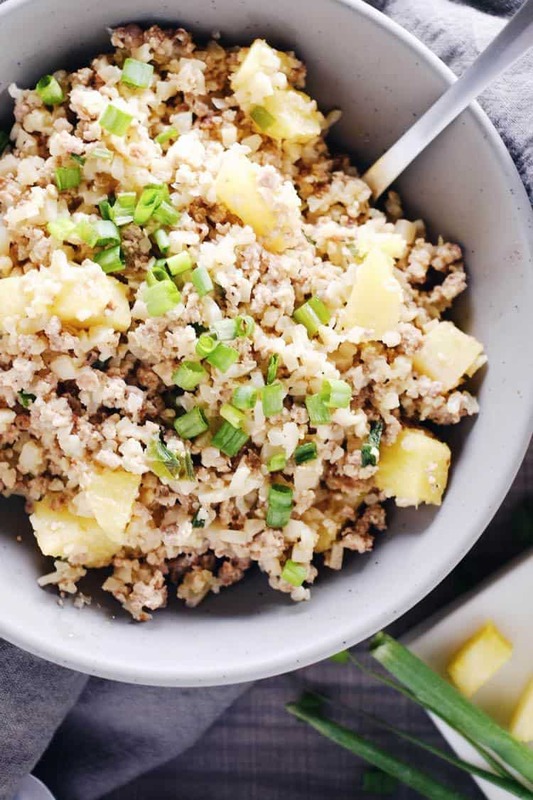 We love this spicy pineapple cauliflower pork fried rice recipe because there are few ingredients, less than 10, and it is quick and easy to execute well! It all comes together in one pan on the stove, which means less cleanup, too! I think we can all get on board with that! We also love using cayenne for adding spice. It is subtle and smooth when it comes to spiciness, and you can do more or less to suit your taste. Your turn! Rice your cauliflower or purchase it pre-riced at the store. 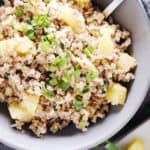 Make this one pan spicy pineapple cauliflower pork fried rice, and then enjoy the flavors and textures! Let us know how it goes by leaving a comment below. Then, take a photo and tag us on Instagram @realsimplegood, so we can check it out! We love seeing your creations! Cut up green onions and pineapple. Rice cauliflower in a food processor with a grating attachment or with a hand grater. Add cauliflower rice to pan. Add pineapple, green onions, coconut aminos, fish sauce, cayenne, and any additional salt and pepper. Cook for 3-4 minutes, stirring occasionally until the rice begins to soften. Remove from heat and serve! Enjoy! I LOVE everything about this recipe! Bring on the quick, filling and flavorful dinners! I made this tonight, but had had enough pork recently. So I subbed diced chicken breast that I tossed with onion powder, garlic powder and arrowroot. Sauteed the chicken in batches to get some browning on them; they were so moist and tender! I also doubled the recipe so I’d have some for lunches this week – except only 50% more cayenne, which was enough spice for me. I wish I had NOT doubled the fish sauce though. I had a bowl for dinner; it was very filling. Looking forward to eating it for lunches this week. Thanks. Sounds delicious, glad you were able to make the recipe work!